More severe storms with rising sea levels and greater tidal surges are wreaking havoc on coastal homes and businesses. Helical Piles have been used successfully to repair damaged coastal structures, and professionals are starting to seek more information about their use for new construction and repair. Since super storm Sandy devastated many coastal properties from North Carolina to Massachusetts, I have had several conversations with people who were directly affected by the storm and with others in the helical pile industry who offer foundation repair services and/or foundations for new construction. Apparently many affected areas have already been told by local, state and federal officials that rebuilding is being endorsed and will happen albeit with revised building codes and standards that (hopefully) will address the potential for equal or greater storm surge and flood protection. Tom Barton, the owner of BartonPartners (www.bartonpartners.com), an architectural and planning firm located in Norristown, PA, lost his family’s 100 year old vacation home located in Mantoloking, NJ when Sandy hit. Mantoloking was one of the harder hit coastal communities with approximately 200 houses that were either completely destroyed or sustained significant damage by the 7 to 8 foot storm surge. 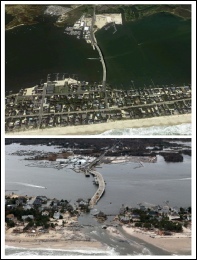 This picture shows before and after Sandy. Tom and I chatted about the potential to use helical piles as deep foundations for the homes that need to be rebuilt and or modified to meet new building codes. Once the codes are revised and building permits are being approved, Tom is anticipating a significant backlog of work for deep foundation piling contractors, and he wants to explore alternative piling solutions. It seems logical to expect revisions in the codes that will require new structures to be elevated in order to qualify for flood insurance. Depending upon the lateral load specifications for elevated structures, helical piles can and have been used successfully as deep foundations when augmented with Sonotubes or cross bracing. HPW is looking forward to tracking and reporting on the potential use of helical piles on reconstruction projects in Tom’s neighborhood. Other discussions focused on repairing the foundations and support members for structures along the outer banks of North Carolina and Galveston, Texas. One of the most knowledgeable people on this subject that I talked with is Rick Sykes, the owner of Ram Jack Foundation Solutions www.ramjackusa.com based in Durham, NC. Besides owning his own home at Spooners Creek near Morehead City, NC, Rick has many years of experience repairing coastal structures in and around Southern Outer Banks, Atlantic Beach, Emerald Isle and Pine Knoll Shores that have been damaged by hurricanes through the years. He has worked closely over the years with management and the engineers at Ram Jack Systems Distribution www.ramjack.com to develop helical piles, brackets and related products specifically designed to address the repair of elevated coastal structures. Rick and Ram Jack’s president, Steve Gregory, are the co-inventors of a patented timber column bracket (see patent here) used to connect helical pipe piles to timber pile support members as part of the process to lift and stabilize damaged structures. Without question helical piles will continue can play a significant role as one of the products of choice used to repair coastal structures damaged by Sandy and other storms. Even more significant is the use of helical piles as a critical component in the process of elevating existing structures and/or the building of new above grade structures to help prevent catastrophic damage from future storms.